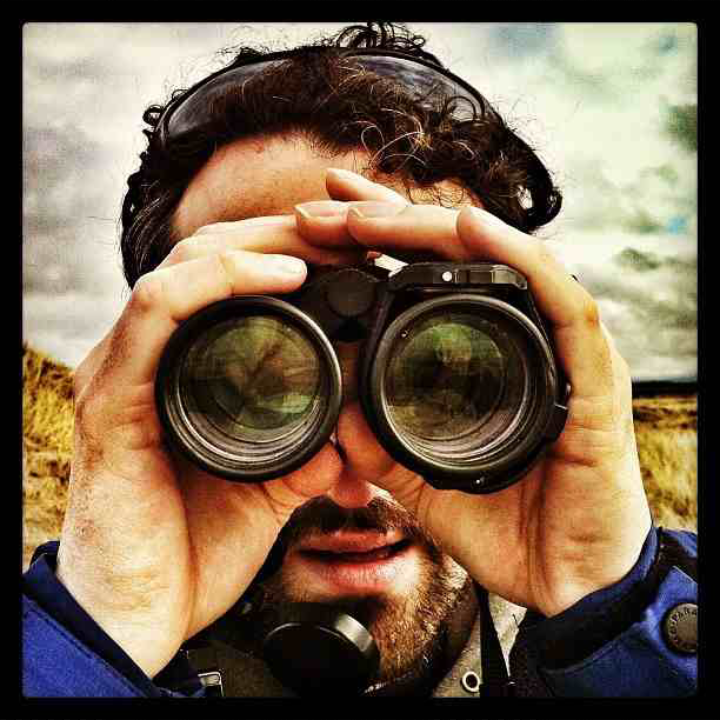 My brother-in-law Duncan has a grand passion for creatures of all shapes and sizes, and his talent for and love of birdwatching have resulted in his spending many a cold, wet morning peering through binoculars to spot and count his feathered friends. Fortunately the cold, wet mornings are fewer now he lives in Malaysia rather than Scotland. When considering the side-effects of my treatment, I can’t help comparing the psychological process I go through with how I imagine it must be for Duncan when heading out to scan the land and sky for birds. There is, of course, a huge roster of birds that he may come across on any given day, in any given place, but I assume he never really knows quite which ones will make an appearance, in what magnitude and for how long. It’s the same with side-effects and complications: there are many things I have been told could happen as a consequence of the chemo, my suppressed immune system and the infusion of someone else’s stem cells. Some are more likely to appear than others, and are expected to a greater or lesser degree, but nobody knows which will surface, when, or to what extent. Whether counting birds or trying to spot side-effects as early as possible, it’s good to know in advance what to look out for. That way you’re more likely to recognise one when it appears, rather than spending your time trying to put your finger on exactly what you’ve just seen / felt. I can’t help feeling, however, that this probably also increases the risk of premature identification. A less experienced and knowledgeable ornithologist than Duncan might be expecting the chance to see a rare bird that includes among its features a green tail, so as soon as a green tail flies into view, s/he is more likely to leap to the conclusion that the rare bird has indeed made an appearance, even if the tail was all that could be seen. Having resigned myself to a continuing run of – er – the runs, after a particularly grotty visit to the bathroom yesterday, I’ve been surprised to find that things have cleared up a bit today. Perhaps I didn’t even need to start filling in the stool chart, but knowing that this was one of the likely side-effects, I assumed immediately that it had arrived. It’s been great not to have to keep dashing to the loo today, though! Day +4, then, has actually been pretty good, as I’m in less discomfort than expected both downstairs and up in the mouth, which has been behaving today. I managed with Mariacristina to cobble together a lunch of sorts, too, despite not being very keen on reducing my hoard of cheese, and enjoyed with her a delicious Bakewell Tart with reggae influences (“they’ve put more Jammin’,” she said). 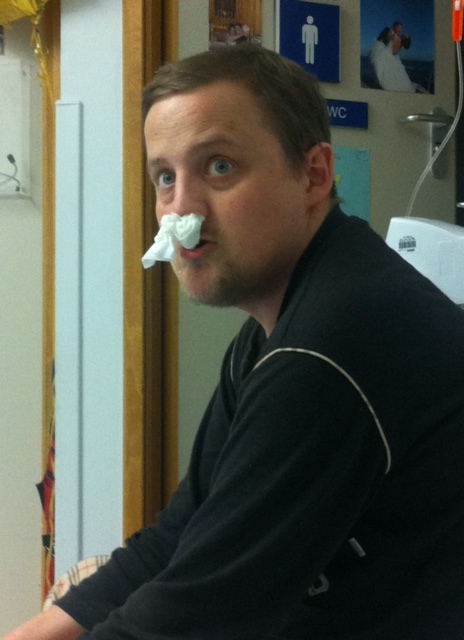 Possibly the most annoying thing at the moment is my runny nose, which might be due to the chemo destroying the follicles that would normally catch anything trying to escape through the nostrils. Blowing my nose doesn’t help, but significantly diminishes my stock of tissues, so for now I’ve resorted to leaving tissues stuck up my nostrils – a charming look. Of course, Duncan is hoping to see birds when he heads out, whereas I’m hoping to see as few side-effects as possible. So I’ll pack away the binos and take them as they come!